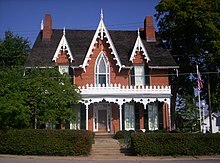 Located in the heart of downtown, the Mansfield Memorial Museum, built in 1887, and opened to the public in 1889 as the Soldiers and Sailors Memorial Hall, is a museum of many different exhibits.Oak Hill Cottage, located amongst the ruins of Mansfield's once mighty industrial district, is a Gothic Revival brick house, built in 1847. One of the most perfect Carpenter Gothic houses in the United States, it is operated by the Richland County Historical Society. Located in the Woodland neighborhood, the Mansfield Art Center, opened in 1945, is a visual arts organization. BibleWalk (formerly The Living Bible Museum), opened in 1987, is Ohio's only life-size wax museum. The Bissman Building, built in 1886, is now open for tours from March to November. The location was featured in Shawshank Redemption as "the Brewer Hotel" and "the Portland Daily Bugle". It was more recently used by the SyFy channel's "ghost hunters" and in recent music videos.